Xiaomi's Redmi Note 6 Pro has been seen online, in which leaks refer to the phone's storage options and color variants. The phone, which started in Thailand last month, can be launched soon in India. Redmi Note 6 Pro is Xiaomi's first smartphone with dual rear and dual front camera configuration. 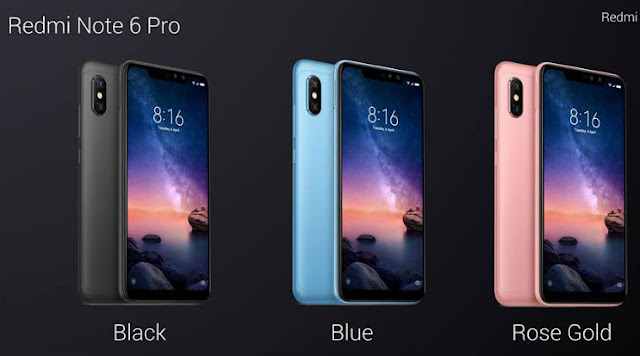 According to a new report from MySmartPrice, Redmi Note 6 Pro is expected in two storage options: 4 GB RAM / 64GB internal memory and 6 GB RAM / 64 GB memory In addition, the phone will be available in four colors: Blue, Red, Black and Rose Gold. In its launch, Xiaomi had fixed the price of the 4 GB RAM version at THB 7000 (or approximately 15,705), although the price of India could have been different. It is speculated that for the beginning of the Redmi Note Pro 6, Xiaomi could hold the launch event in India in November, although this is just an estimate. Speaking about its specifications, Xiaomi Redmi Note 6 Pro plays 6.26 inch FHD + display and plays 9: 9 aspect ratios. It is powered by a Snapdragon 636 processor and runs Android 8.1 Oreo. It is supported by 4,000 mAh battery and has a fingerprint sensor on the back. At the front of the camera, Redmi Note Pro 6 has a dual rear camera configuration, which is vertically covered. It is composed of a 12 MP primary sensor, and a 5 MP secondary lens, which comes with 1.4μm pixel, F / 1.9 aperture and dual pixel autofocus. Also, on both sides of the receiver Mike, there are two front cameras at the foot of the phone. These include 20 MP primary sensors with F / 2.0 aperture as well as 2 MP depth sensors.